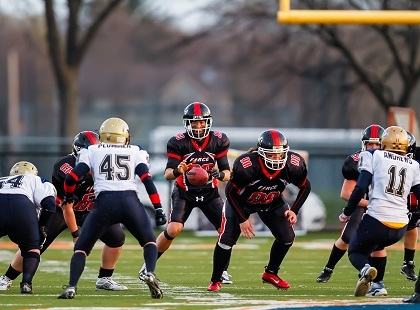 EVANSTON, IL: The Chicago Force offense was as cold as the near-freezing temperatures for most of the first half against the West Michigan Mayhem. With Chicago's all-world quarterback Sami Grisafe sidelined with an injury, the offense made it harder for themselves with 6 fumbles - five of which were recovered by the Mayhem. With just 10 seconds remaining in the first half and the score 0-0, Head Coach and Offensive Coordinator John Konecki took a time out to make an adjustment. It was time well spent as running back Elisha Okrey took the ensuing handoff and burst through a seam up the middle for a 70 yard touchdown run. Darcy Leslie then punched in the two point conversion attempt to give Chicago a 8-0 lead which they carried into halftime. There was no scoring in the third quarter as both teams struggled to sustain drives. The Chicago offense brought out a new power look in the 4th quarter and it immediately paid off with running back Kelsey Casey ripping off a 67 yard touchdown run on the second play. Leslie again converted on the two point rushing attempt to push the Chicago lead to 16-0. Casey would score two more touchdowns in the fourth quarter and finished with 294 rushing yards on 37 carries. She was named the Offensive Game Day MVP for her performance. 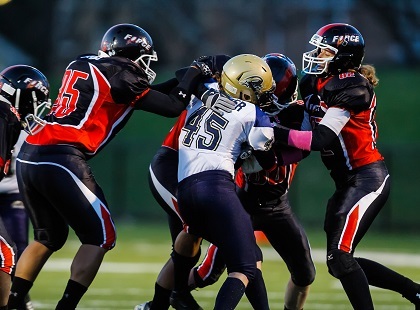 The Mayhem offense was never able to capitalize on their opportunities as the Force defenders swarmed like bees. Chicago Defensive Coordinator Adam Lewandowski was happy with the overall effort from his players, "We had a couple of breakdowns in pass coverage and alignment, but for the most part I was happy with our effort and execution." Elisha Okrey was named the Defensive Game Day MVP for her five tackles and two interceptions. Amber Kimbrough played very well and led the defense with 11 tackles, 4 for a loss. Elina Kero and Emilie Belanger each added 6 tackles as the defense held West Michigan scoreless and limited them to just 100 yards of total offense. Konecki was patient regarding the slow start, "We had a lot of personnel changes which led to many of the early game mistakes. We'll keep tinkering until we find the winning combination." Chicago remains undefeated at 4-0 and are atop the conference standings. The Force go on the road this week for a divisional rematch with the Indy Crash, kick-off is at 7pm EST at Marian University.